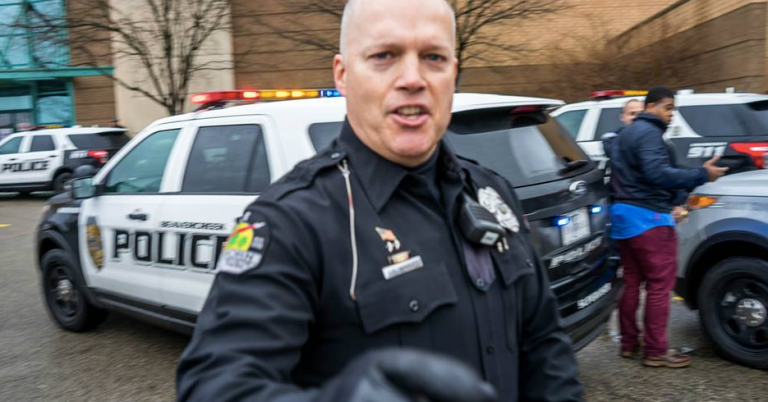 An independent journalist was arrested by Beavercreek Police during a protest against the shooting of an unarmed African American father, talking on his cellphone with the mother of his child and his own mother, who were baby-sitting. That man, John Crawford, was on his way to a cookout and stopped at Walmart for some things. While talking on the phone, he picked up a legal, non-lethal air rifle toy that was open and on the shelves. He looked at it while speaking on the phone in the most remote aisle of the store. Surveillance footage shows that no shoppers were threatened, nor were they panicking. Several shoppers came down the same aisle and saw he was no threat. 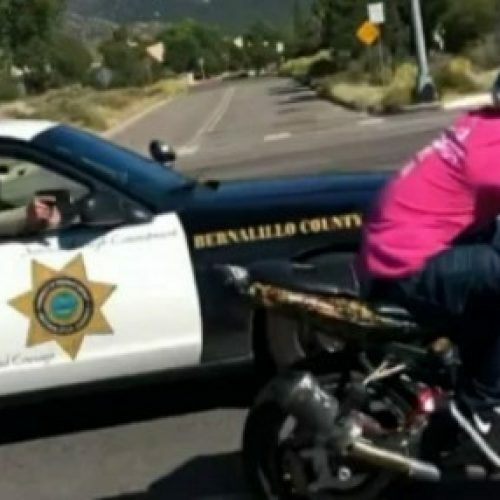 Even though he was immersed in a conversation, officers who arrived on the scene did not even give him two seconds to respond to their orders. As he turned to look, even while the toy was pointing away from the officers, he was shot by Beavercreek officer Sean Williams. Protests have erupted on the streets of Greene County Ohio ever since. But at some of the more recent protests, officers have amped up their response: escalating violence against protesters and inciting rather than deescalating. At the Christmas Eve “die in” at the Fairfield Commons Mall, right across the street from the Walmart where John Crawford was killed, several members of the media were threatened with arrest after they identified themselves as reporters and news photographers. One of them was Virgil Vaduva of the Greene County Herald. 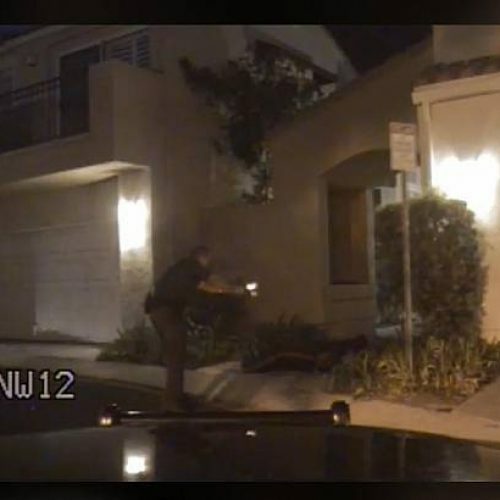 Unbeknownst to the police, the journalist’s cell phone continued to record the interaction with police and other arrestees, capturing what happened behind the “thin blue line” when police believed that nobody was recording. The audio captured Beavercreek police officers mocking the shooting of John Crawford and the killing of Eric Garner. Previous reports, coming to us from citizen journalists in the crowd of protesters, photographed a Beavercreek police officer stomping on a banner calling for Justice for Eric Garner. For their part, Chief Evers told one of our reporters that he does not believe the officer in question intended to do this, and that he believes he was unaware that the banner had Eric Garner’s name on it (though it is clearly identifiable in the phones sent to us). Nevertheless, the comments recorded in this audio do document the Beavercreek Police Officers mocking Garner as well as the death of John Crawford. 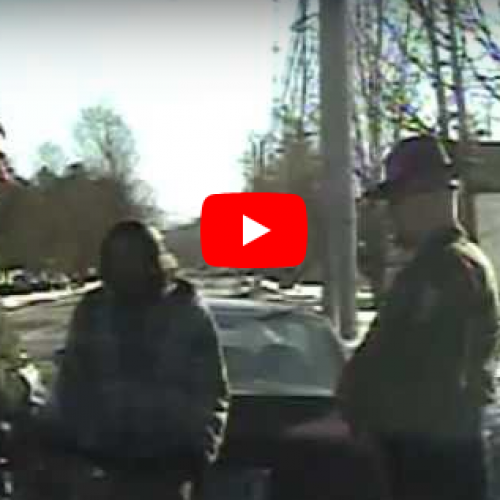 Beavercreek police officers mock police killings from Greene County Herald on Vimeo. After mocking the shooting of John Crawford, the journalist really let the officers have it: calling them out for their criminal behavior. If you agree with them SPREAD THE WORD by forwarding this article to everyone you know who cares about the Constitution and police abuses. SPREAD THE WORD by sharing this with everyone you know who believes that the freedom of the press cannot be infringed by officers who seem to have forgotten that they have sworn to uphold the Constitution.